The answer is Yes – bacon cut, bacon grease, rind or jerky are okay for cats, BUT YES – only in moderation or as an occasional treat. 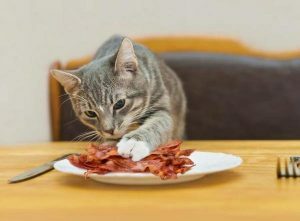 Your kitten might get the smell of your breakfast bacon dish and always crave for a bite or two, but as a responsible cat owner, you must put restrictions on your cat’s diet. You should remember that a fat cat may look cute, but they do not stay healthy in the long run. So, use it as a celebratory food if only your cat loves it. Cats are carnivores, and their biological systems have entirely evolved from that perspective. Hence, bacon, being meat, is good for your cat. Other than fat, it has high protein content (approximately 3 g/slice) and does not also contain carbohydrate that will upset your cat’s stomach. You might also opt for bacon flavored cat foods since these are said to be relatively safer for your felines. Serve your cat only uncured (salt-free) bacon as the salted and smoked variety is high in sodium and preservatives, which is harmful to your feline when consumed regularly. Bacon is a cut from the side of a pig, and hence, is quite full of saturated fat. Though this fat is not as harmful to cats as it is to humans, but an excess of it is also not acceptable. Frequent consumption of bacon will only make your cat get fat day by day and even tend to create an arterial blockage, eventually leading to heart diseases. Always provide your cat with cooked bacon, prepared at an internal temperature of 60° C (140° F) as the raw form might contain a worm larva called trichina, leading to a parasitic infection, trichinosis when consumed. Published on December 2nd 2017 by admin under . Article was last reviewed on 2nd December 2017.